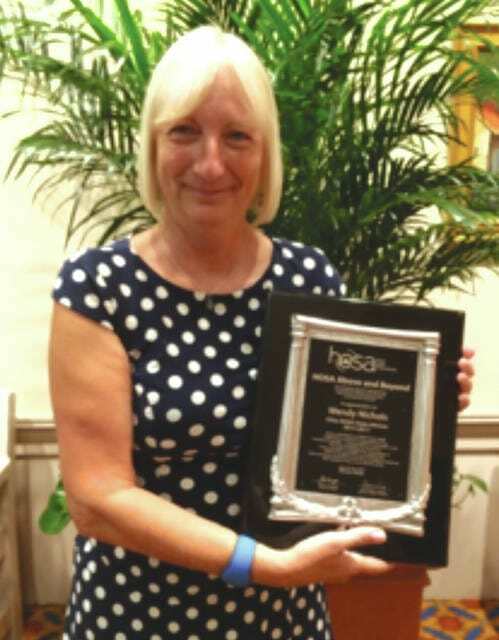 Delaware resident Wendy Kibler Nichols received the National Above and Beyond Award at the HOSA International Leadership Conference held in Orlando, Florida in June. Wendy Kibler Nichols received the National Above and Beyond Award at the HOSA International Leadership Conference held in Orlando, Florida in June. Over 10,000 Health Science students, educators and guests attended the conference. Nichols, Ohio HOSA State Advisor from 2015-2017, was recognized for her commitment to HOSA — Future Health Professionals and for her understanding of the meaning of “synergy” — working together to accomplish more. This award recognizes her investment of time and talent on behalf of the young people of HOSA. Under the direction of Nichols, five regional leadership conferences were initiated in Ohio and membership increased over 30 percent. Ohio HOSA was also invited to participate in the Grand Rounds of the U.S. Surgeon General at the Cleveland Clinic in the summer of 2016. The Surgeon General personally recognized Nichols and a state officer who were in attendance. In addition to her work with HOSA, Nichols serves as an adjunct professor at Bowling Green State University in the College of Teacher Education and is the Resident Educator Mentor Coordinator for the ESC of Central Ohio in Columbus. She has also served multiple terms as the president of the ATPA Division for Ohio Association for Career Technical Education. Born and raised in Marion, Nichols currently resides in Delaware with her husband, Walter.